Lt. Gov. 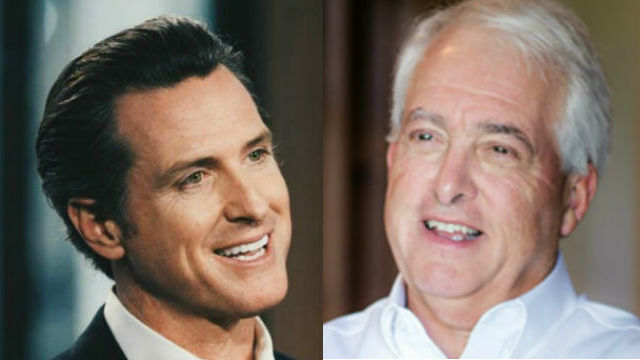 Gavin Newsom maintains an “unassailable” lead in the race for California governor, with Republican businessman John Cox of Rancho Santa Fe likely to be in second place and in the running after Tuesday’s primary, according to a new poll. The statewide survey of 500 voters by San Diego’s Competitive Edge Research puts Newsom at 31 percent, Cox at 23 percent, former Los Angeles Mayor Antonio Villaraigosa at 13 percent, Assemblyman Travis Allen at 10 percent, former state schools Superintendent Delanie Eastin at 5 percent and Treasurer John Chiang at 4 percent with less than 10 percent of voters undecided at this point. John Nienstedt, founder of the polling firm, described Democrat Newsom’s lead as strong and steady. “I think that’s formidable. I think that’s unassailable,” he said. The poll assumes that turnout will be no higher than 30 percent, despite a record level of new voter registration in California. Nienstedt said that even if Cox gets to second place, it will be an uphill battle for a Republican to be elected governor in November. In fact, he said, Newsom’s position will be strengthened by having a Republican as his opponent rather than another Democrat. However, having Cox on the ballot in November will encourage Republican turnout, Nienstedt said, boosting the chances of Republican congressional candidates and the gas tax repeal measure. He noted that Villarigosa, despite his name recognition in Los Angeles, did not appear to be effectively leveraging his base among Latinos and Southern California residents. The poll was conducted May 29-30 by professional interviewers. It has a margin of error of 4 percent.